Bowie. Bolan. The Dolls. These are the names that we have hallowed through the decades as bastions of glam rock, the genre that defined the early ‘70s urban rock scene. Simultaneously swirling around the glam galaxy was a soft-spoken, fair-featured piano prodigy who called himself Jobriath, and though he is less featured in the annals of music history, his influence is no less felt by generations of flamboyant, theatrical rock performers who came after him. Often cited as the first openly gay rock star, Jobriath rocketed from musical theatre actor and folk songwriter to full-on glam star in seemingly no time at all, thanks to aggressive marketing strategies from his Svengali-like manager, Jerry Brandt. Jobriath burned hot and bright for a few years, but his star fell just as quickly as it rose, and he spent the remainder of his days living out of the pyramid apartment on the roof of the Chelsea Hotel before his premature death in 1983. In this episode, we unpack the many ways Jobriath’s story — though shorter than his glam peers — has volumes to teaches us about the genre, changing social norms between the last decades of the 20th century and now, gender and sexuality, and why in the h*ck someone would even want to be famous in the first place. If you know Jobriath, welcome. If you’re new to the party, there’s room for you here, too. Listen, we know Spotify is mostly shady. But, man, we’ve discovered — and re-discovered — so many awesome artists through our Discover Weekly playlists, and that’s worth a shout. The hype machine behind Jobriath is very much of its time. We had a lot to say about how we look at it now, and whether or not that could happen today. Have thoughts? Get at us. Shoutout to the collapse of the American Dream and its reverberating effect on how we consume culture as a whole!!! If you are any kind of sociologist, anthropologist, historian… in that general realm… and want to talk to us about this for show purposes, YOU KNOW WHERE TO FIND US! VERY IMPORTANT QUESTION: Is Richard Gere a zaddy!? Ya we know, totally random that he was at the recording sessions for this album but, hey, the ‘70s. If you are like “tf is a zaddy…” please pause what you’re doing and take a look at our updated glossary page. We’ll wait. Needless to say, the album bombed and music journalists — mostly men, duh — had a field day writing “you’re a cheap Bowie impersonation” takedowns. We stan a good, hit-the-ground-running album opener! Jobriath made great strides as the first openly gay rock star, but it’s interesting to see how much he kept private at the same time. Carly is ABSOLUTELY that Theatre Girl who will reference obscure cast recordings, do not @ us!!! Again, maybe Carrie’s 21st century cynicism speaking but: When an artist candidly states their desire for fame and a glamorous life, how do you tell what’s authentic? When does their art transcend being something they love and becomes something they do because it gets them fame? Okay but seriously, peep the lyrics to “World Without End” and try to tell us culture isn’t cyclical af. Is “Space Clown” just generic brand “Starman”? Shoutout to songs that have shoutouts to other people and influences — we love a good fangirl/fanboy moment!!! ICYMI here’s our Tom Tom Club episode we dropped a silly reference to. @ drag queens: seriously consider doing “Movie Queen” in your act. You’re welcome! More info about Jobriath’s alter ego Cole Berlin in our further reading notes below. We’ll do an episode on John Cale eventually. We know we bring him up too often for not having given him his own episode to shine. Masculinity is so complicated and we cannot believe this song about the ways it can be both aggressive and fragile came out in 1973. Like, seriously, we’re only now starting to seriously talk about gender and toxic masculinity and just now see more inclusivity for pop stars challenging gender norms. Shouts to Jobriath for bringing this up decades ago. Here’s a quick guide to androgyny in rock — which shows its male privilege and begs us to question: Why weren’t women afforded the same opportunities — or as many opportunities — to gender-bend as their male counterparts? In the end, it’s all a flex. Once again, we LIVE for the way ‘70s music referenced rock of the ‘50s and how much glam influenced punk. Musical family trees are our bread and butter, truly. It’s incredible see how much Jobriath’s legacy lives on, particularly in very recent history. You know we’ve got a bunch of examples for you in our new and improved master playlist. We’ve split our playlists up by season because the one got too big. You’re so welcome! Follow season one, season two, and season three (we’re on season three now). As always, find and follow us on Facebook and Twitter if you don’t already. In the 2013 documentary History of the Eagles, the late Glenn Frey describes his bandmate Joe Walsh as “an interesting bunch of guys.” The statement is meant to be comedic relief, there to set up the story of how the wild, unpredictable Joe Walsh — the one famous for hotel room trashing antics — ushered in a new chapter of the Eagles’ late-70s hedonism. But, if you take a closer look, the description rings true for his musical sensibilities, as well. Few places can it apply more aptly than 1973’s The Smoker You Drink, the Player You Get, Walsh’s second solo album in collaboration with his band Barnstorm. Though the album would come to be remembered mostly for its lasting arena rock hit “Rocky Mountain Way,” Walsh explores all of his musical personalities, from the dad rock shredder to the softer, more introspective, singer-songwriter to the psychedelic-influenced long-winded jammer. In this episode, we dig through the varied influences Walsh pulls from, discuss Barnstorm members’ individual contributions, unpack the multitudes Joe Walsh contains, and more. *at this time, The Smoker You Drink, The Player You Get is not available in the US on iTunes, nor is it in full on YouTube. Hello, and welcome to a fun and chill and casual summer episode. Think of this as a not-so-guilty-pleasure beach read, but let it also be a lesson in not judging books by their covers! Joe Walsh has had quite a career, from the James Gang to Barnstorm to the Eagles, and, wow, quite a life. When we getting the biopic, Hollywood? He is an interesting bunch of guys. Peep our further watching links below to watch Joe Walsh’s apology to millennial audience members because l o l.
Shoutout to Joe Walsh for embracing different technology on this album, particularly on this track. For real, you would never associate an ARP synth with early-70s Cal rock. That talk box tho. Here’s a more in-depth explainer of what it is and how Joe Walsh came to use it. We love The Parent Trap (1998) do not @ us. If you love our love of sister songs, get ready for our discovery of cousin songs! Isn’t it cool how centuries-old styles can influence modern classic rock? Here’s a little explainer on what a pastoral is, if you’re curious. Friendly reminder to hit up our master playlist on Spotify to listen to all these similar and influential tracks we’re dropping. Shoutout to Joe Walsh for letting all members of Barnstorm collaborate and write tracks or sing them on this album. It’s not your typical solo venture. Sorry not sorry we seem to say “Jenny Lewis should cover this” in multiple episodes. She’s just guud. Check out our further watching links below to see Joe Walsh continue to shred tf out of “Meadows” in this century. You know we like to stand up on our “bands are a sum of their parts” pedestal, and this is no different — all members of Barnstorm had their own unique contributions. Positioning Joe Walsh as a solo star was very much a label-head marketing move (and one that ultimately worked to his benefit). Hi, the Eagles love they money, bye. Legacy is such a weird thing, and because Joe Walsh, and this album, have such eclectic styles (aside from his distinct guitar playing style), how do you trace their lineage to this generation? We have some of our thoughts in our master playlist, but we’re still thinking about it. Does this album have stand-out elements that make it immediately identifiable with Joe Walsh, or does it sound like a pleasant, but “could be anyone” vibe? Is that even necessarily a bad thing? Did we miss anyone? Who today shows strong Walsh and/or Barnstorm influence? Share all your thoughts with us! Get out your cargo shorts and fire up the grill, because this week we’re going back to Dad Rock territory with ELO’s landmark 1976 album A New World Record. Often thought of as the best representation of ELO’s sound — and the pinnacle of Jeff Lynne’s arrangement, writing and production — this set of songs draws from a bevy of richly melodic influences, from the Beatles to the Beach Boys to ‘50s street corner doo-wop to possibly even John Cale. With such perennially loved sounds baked into its foundation, what makes A New World Record sound dated to modern ears? How could arrangements and orchestrations of such timeless origin be connected so deeply to one decade? Is it possible, in 2018, to genuinely love this album for what it is, with no trace of irony? Join us for a discussion about that, musical legacies and evolution, and song connections — and maybe, if you listen closely, you’ll hear a dad joke or two. Hello, and welcome to another episode with your sensitive and feels-feeling hosts! We are highkey passionate the concepts of legacies, preserving history and learning from it, keeping stories and traditions alive, and, as millennials, carrying the torch. As always, we would love to talk to you about how we, as millennials, can carry the torch. We’ve discussed the broad landscape of music that came out in this same time period on several occasions. For more historical context or further discussions, check out our episodes on Television’s Marquee Moon, Tom Petty & the Heartbreakers’ self-titled debut, Jackson Browne’s Running on Empty, Rolling Stones’ Some Girls, Blondie’s Parallel Lines, and/or Patti Smith’s Easters. Seriously, though, when is the last time Jeff Lynne was seen without his sunglasses? Related, this dog honestly does look like him. Take: “Dated” doesn’t always necessarily mean bad or unenjoyable. 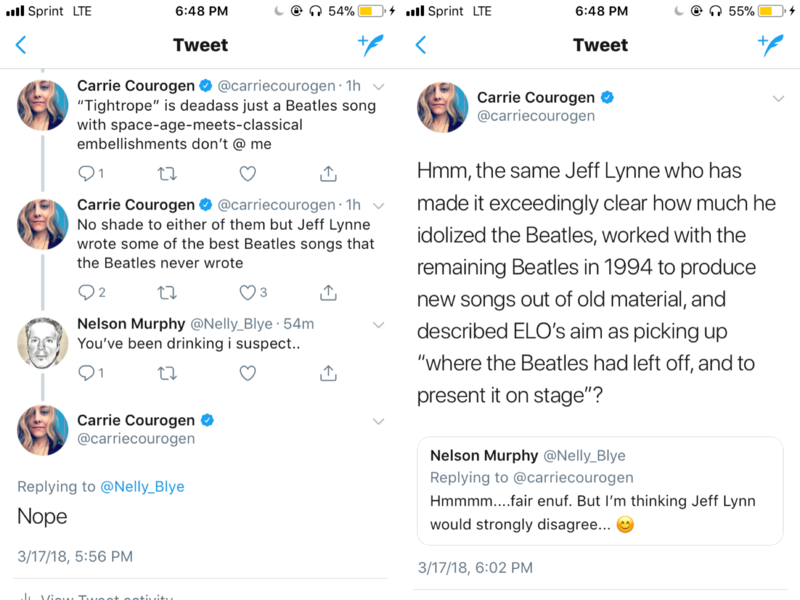 And we don’t care if it’s not cool, among millennials especially, to like ELO. We super don’t care. We know we are not cool. Shoutout to Kelly Groucutt and Bev Bevan for being underrated groove champs on this album. “Tightrope” is really just a Beatles song with classical embellishments. Don’t be like this guy and tell us we’re drunk for thinking there’s a connection. We are highkey here for all of Grace Spelman’s music nerd playlists, but Welcome to the Album, a playlist comprised solely of excellent opening tracks, is truly fantastic. A friendly reminder that at the end of the day, all of the songs have been written. Originality comes when you incorporate past influences and build upon them to make something new and unique. All good art is stealing, and appropriation is the sincerest form of robbery. Shoutout to the Traveling Wilburys. Again. We love those guys. Telephone songs are so cool in that times change, but sad phone calls have stayed relevant. Here’s one great piece on them. Shoutout to songs that namecheck influences. Question: What would “Rockaria!” sound like if it got “Genius of Love”-d tho? Or if “Genius of Love” got Jeff Lynne-d? @ people who grew up with great expectations for the 21st century: we are sorry. We wish we had robots and stuff like that, too. Yeethoven (pronounced YAY-to-ven, sorry) is an absolutely brilliant orchestral mash-up project by the Young Music Foundation that saw their debut orchestra performing Beethoven interspersed with tracks from Kanye West’s Yeezus. Trust us, it’s fascinating to hear the similarities and see how classical music is very much still relevant in modern music today. It was such a banger that they did it again with songs from The Life of Pablo and it slammed. Here’s more about how the band used a Moog in a really awesome, early-adaptive way. This video of James Jamerson basslines, animated, from our fave millennial funk torchbearers Vulfpeck is DOPE. SOIP = summer of infinite possibilities. Any song that evokes a feeling of infinite, electric, so-young-and-alive feelings — no matter your age — is a SOIP song. Shoutout to Fanny, again, for those slamming backing “higher and higher” vocals! Seriously, someone please make us a mash-up of “Livin’ Thing” and “Love Train.” HOW does one not exist already? Will we somehow find a relevant way to shoutout Christine McVie in every podcast episode? Stay tuned to find out. If anyone can find us OG versions of “Above the Clouds” and “Do Ya” by The Move, we would really, really love that. We promise we’re going to do an episode on the Wilburys at some point. Swear. End of the night songs are great songs. Check out our Tom Petty and the Heartbreakers episode or our T. Rex episode to hear more what we have to say about them. As always, hit up our master playlist on Spotify for all the songs we mentioned today in one place. Jeff Lynne and George Harrison Play Banjos | Date unknown, but appears to be from a documentary on George Harrison. Reach out if you know which one it is! In our second mini episode, we explore the titular track from Lou Reed’s 1978 “comeback” album. This is a song rich in narrative and evocative imagery, running over 11 minutes long and effectively capturing a moment in time in New York City from Reed’s unique perspective. It’s a ghost of a song, the effects of which can still be felt in the city of its setting, even though its events can no longer be experienced. Here, we parse through the three parts of this song, discuss its historical context, make connections and comparisons to another ’70s New York rock odyssey, consider the impact of Lou Reed’s songwriting on future generations of musicians, and get a little sentimental about the New York of yore, even though we totally weren’t there. Hi, hello, and welcome to another mini episode! Life comes at you fast, and while we work on a real-length episode and also do all the stuff we do in our professional lives, we thought we’d hit you with this snack-sized bit. And, yeah, don’t worry — we’re definitely doing Velvet Underground and/or more solo Lou Reed in the future. There’s a lot of background info about Lou and VU that we won’t bore you with here. There’s this cool thing called Google if you want to learn more. See our further reading links below to read up on the long, contentious relationship between Lou Reed and Lester Bangs. Here’s some science stuff about binaural recording. This song is long and intricate AF, so put your headphones on and buckle up. Shoutout to Lou for subverting gender norms in the Waltzing Matilda section! Turn your volume WAY up and tell us if you agree or disagree with Carly about the beginning of the Street Hassle section sounding reminiscent of Christine McVie. The Factory was wild!!! Here’s some more info. Pop over to our master playlist on Spotify for a handful of songs to explain that “this song is in a bright major key even though the lyrics are dark!” thing. If you want to feel shook at how city life remains still pretty much the same in 2018 as it did in 1978 and as it did in 1903, then you should definitely read this essay, Metropolis and the Mental Life. Here’s a lil something about that Springsteen collab. And a lil something about Rachel, Lou Reed’s transsexual muse. Do we have any artists, currently, who are disciples of Lou Reed? We’re not sure, but we loaded up our master playlist with some influences. And, as always, we’d love to hear what you think. After the March 1970 release of Crosby, Stills, Nash, and Young’s Deja Vu album, each member of the group embarked on their own solo work. Neil Young’s output was After The Gold Rush, an introspective, sometimes controversial, but ultimately hopeful collection of songs. The album presents its themes of heartbreak, loss, environmentalism, racism, and ambivalence without affectation; Young is simply offering points to consider, and it is up to us how we choose absorb and interpret them. Initially met with mixed reviews by critics, After The Gold Rush grew to become one of Neil Young’s most beloved albums, laying a foundation that numerous artists in the subsequent decades have built upon. In this episode, we discuss the political themes of this album that are still relevant today, dissect Neil Young’s versatility as a songwriter, connect the Laurel Canyon sound to today’s Americana artists, and, bewilderingly, manage to reference DJ Khaled once again. We’ve officially been a podcast for a full calendar year! Here’s a video from the early MTV days that reflects our mood. Hey, sorry not sorry for spamming you with this. We had a ton of fun on Chris Frantz’s Talking Head radio show at WPKN. You will have fun listening (if you have not already). Listen to it in the archive here. We’re doing #MWE! AKA, a Twitter thing where, every day for the month of February, music writers, fans, etc. pick an album they’ve never heard before, listen to it, and tweet a review. Follow us on Twitter to see our diverse picks so far. We turn tf up for dad rock, if you haven’t noticed already. Seriously, though, why do so many songwriters compare the turbulent changes of life to sailing or the sea? We’re going to be dropping references to SO. MANY. SONGS. in this episode, including a bunch of great covers of “After The Gold Rush.” They’re all collected in our master playlist on Spotify for your listening pleasure. If anyone has any more information about that screenplay Neil was making music for, hit us up. We discussed the Great Graham Nash and Joni Mitchell Breakup of 1970 at length in our Songs For Beginners episode. If you need to catch yourself up, re-listen to it here. Never forget: You’re a boss, you’re a don, you’re an icon, you’re a legend. Much love to the soft boys of rock and roll. We love you. Unlike Patti Smith and “Rock and Roll N****r,” Neil Young actually admitted it’s problematic, which we appreciate. See our further reading notes below for a must-read story about how Merry Clayton — who did a fire cover of this song — ended up grudgingly doing backing vocals on Lynyrd Skynyrd’s “Sweet Home Alabama.” It is essential. There are a lot of different viewpoints to be had when it comes to this song. We’d love to hear your thoughts on it. Get at us on email or slide into our DMs on Facebook or on Twitter if you’ve got opinions you’d like to share. At the end of the day, culture is cyclical, as we’ve said many times before, but not always in a good way. It’s embarrassing that this song is still relevant nearly 50 years later. If you’re new here: we stan sequencing. Get used to it. See our further reading links below for more about Jack Nitzsche’s storied musical history. RIP Webster Hall. We won’t speak of what’s to become of you, but it cannot be good. Carly has a special classification of songs that are “breakfasts of songs.” Ask her about it. Neil is still going strong. He just starred in a weirdo Western movie directed by his girlfriend Daryl Hannah and recently put his enormous archive online. So, um, yeah. First time here? Miss an episode? Just feel like listening to something again? Visit our episode archive to dig through all the albums we’ve covered so far. Oh, and here’s a bonus outtake from the episode as a special birthday gift for you all. You are so welcome. After a debilitating injury stood between her disjointed second album and the imminent recording of her third, Patti Smith wrote a poem that would inform her next collection of songs by taking her physical pain and turning it into sonic glory. The poem “Easter” detailed her own “resurrection,” her journey to triumph over hardship. A concept was born and the album that would share the poem’s title became Smith’s greatest commercial breakthrough. Containing the monster hit “Because The Night,” the controversial “Rock N Roll N****r,” and raucous, protest-ready “Till Victory,” Easter is a celebration not only of human will, but of female power. Negotiating for complete creative control over her album (a year before 9 to 5 brought gender inequity in the workplace to the national spotlight), Smith made no concessions to how male record executives thought she should present herself. Appearing raw and unpolished on the album cover, growling her desires and bellowing her neuroses in her music, and standing by her artistic convictions, Patti Smith demanded that women be seen on their terms, exactly as they wanted to be. Forty years on, Easter remains a catalyst for feminism, a stronghold for lyric poetry, and an icon of blood-pumping, heart-racing, hair-raising rock and roll. While the cover of Horses was shot by Patti’s close friend and ex-boyfriend Robert Mappelthorpe (who has taken numerous stunning, iconic photos of her as a muse), Easter was shot by Lynn Goldsmith, who is one of our favorite rock photographers. Her Instagram is dope and you should check it out. Turn tf up for feminist activism. The revolution will be soundtracked by Patti. Discuss: who, if anyone, could Patti Smith be compared to, artistically? Hi, we love when women sing men’s songs, bye. The Angelfish cover of “Kimberly” isn’t on Spotify, but you can listen to it here. Unrelated but sort of related: could we call people on the phone more? Here’s more info about the history of “Ghost Dance” as a Native American prayer song. And here’s more info about Gary Snyder’s Passage to More Than India, if you’re so inclined. “Babelogue” is so full of wonderful imagery that you really should read the lyrics to it to fully digest it all. Here’s our friendly reminder that you can — and should — hold people you admire accountable for faults that can be fixed. To look the other way would be idol worship, and we don’t play like that. Patti. Patti, Patti, Patti. WHY? Here’s one thought-provoking observational piece on it. And here’s an article from 2016 in which she still defends it, just not as aggressively. Discuss: Do you think this was a creative, artistic choice for the sake of art, or a deliberate decision made knowing it would push buttons and create controversy? Moral of the story: WORDS. MATTER. To learn more about this “wild woman” theory, check out this book that was recommended to us and we are now recommending to all of you. Patti. Girl. With that Sunday night CBGB reference, you super aren’t fooling anyone into viewing the subjects of this song as anonymous people. Here’s a site that’s definitely not at all from the late-90s era of Geocities site building (nope, no way) about Arthur Rimbaud’s Une Saison En Hell. GO. SEE. PATTI. SMITH. IF. YOU. CAN. AND. HAVE. NOT. DONE. SO. ALREADY. It will probably maybe definitely change your life. READ. HER. BOOKS. (they’re in the further reading links below). They will gut you emotionally. In 1970, while at work on what would be one of her greatest pieces of work, Blue, Joni Mitchell wrote lyrics to “River,” an achingly confessional song of longing and loss that just happened to be set during the holiday season. In the ensuing decades, it took on a life of its own, accidentally entering into and securing a spot in the Christmas music canon as a modern classic. An unconventional carol, its heartbreak has served as a touchstone for all those bereft during what is proclaimed to be the most wonderful time of the year, a deeply personal song that has become a universal reassurance that it’s okay to not be okay. In this special holiday episode, we unpack Joni Mitchell’s iconic song and its history and meaning beyond its attachment to Christmas, discuss the pop culture circumstances that allowed for it to be adopted by the holiday, and why it has remained a source of comfort for a vast array of people this time of year. It’s pretty hard to write a new Christmas song that will make it into the Christmas canon — check out our master playlist for a few examples. See our further reading links below for some more deep reads about how “River” came to represent Christmas. Here’s one essential appearance in pop culture that helped cement its place in Christmas. Sometimes it’s nice to just listen to music that makes you feel your feels. Here’s a playlist for that. And, yes, if you feel like it, a 37 track long playlist that’s just “River” on repeat actually exists. Many thanks to all who have listened to our podcast this year, especially to those who have shared it or have reached out to us to talk about this music we love (and so much more). You all made this a small glimmer of goodness in an otherwise garbage fire of a year, and we hope we provided a little bit of the same relief to you, as well.